Fermentation monitoring is always done to make sure the fermentation is progressing as expected and not "sticking". It is also desirable to know the temperature because the peak fermentation temp strongly affects how much tannin is removed from the skins. Electronic monitoring was introduced to reduce the need for manual measurements of temperature and specific gravity which are quite time consuming. During this trial both electronic and manual measurements were made to develop a correlation between the two. Must weight was measured rather than specific gravity because reliable specific gravity sensors are not available at any reasonable cost and because must weight is independent of temperature. The pressure sensors used to measure must weight are inexpensive gauge pressure sensors ($14) with a range of 1.46psi which output a 0-5V analog signal proportional to the pressure. A 2.4GHz wireless mote with internal A/D converter captures this analog signal and transmits it to a gateway with data base and web server which provides the data to any browser anywhere on the web. Must weight declines by about 1/2 the Brix reading or about 13% during the course of fermentation as sugar is metabolized to ethanol and CO2. The weight loss occurs as the CO2 comes out of solution and evolves from the must which is not necessarily when the CO2 is produced. This is why the weight changes discontinuously around punchdowns which agitate the must releasing CO2 dissolved and/or trapped below the cap. 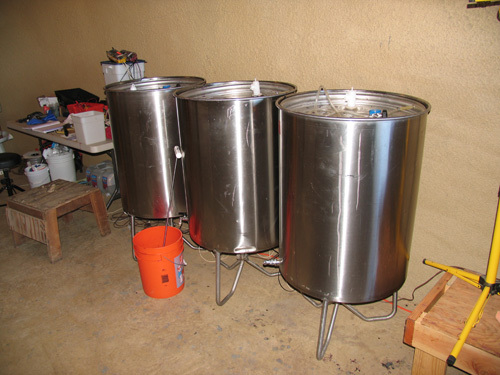 Here are my three 66 gallon fermentation tanks filled with about 42 gallons of Merlot must each. Here you can see the two motes transmitting data, 514 and 515 and the wires to the temp probe which is manually inserted into the must and gets sealed in along the variable capacity tank seal. 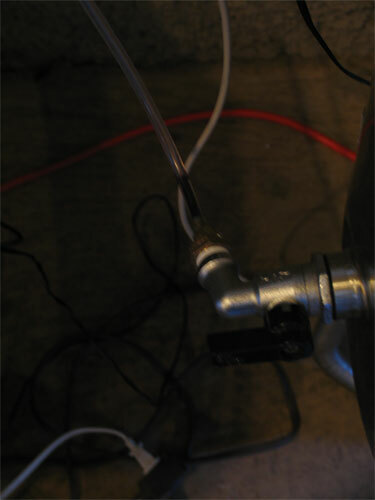 The pressure sensor is connected via a 1/8" clear plastic tube and adpator fittings to the valve at the base of the tank. 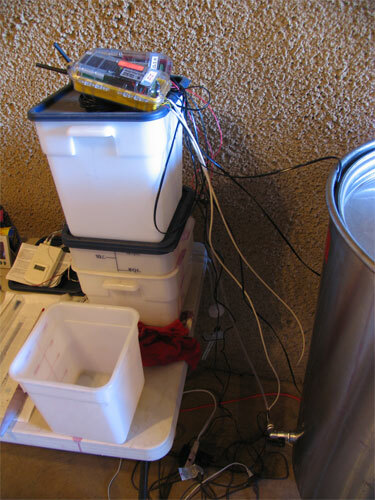 Manual hydrometer measurements of Specific Gravity vs. wireless pressure sensor based measurement. There is a significant unexplained discrepancy in the tail of the curves. One hypothesis for the discrepancy is that the weight change depends on evolution of CO2 which continues quite a while after the fermentation stops. If the volume decreases at the same rate the weight decreases as the CO2 evolves then the S.G. would remain constant while the weight decreases. 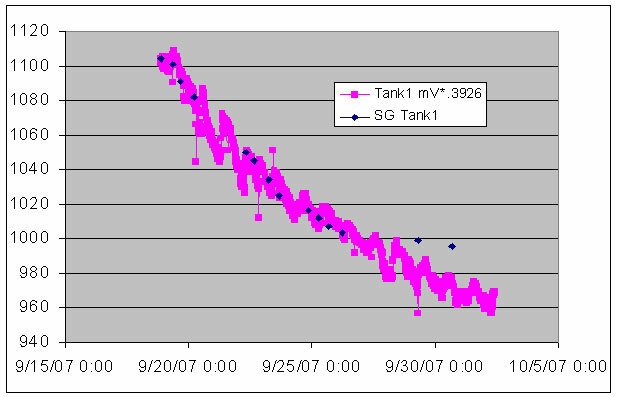 The weight change for this tank did eventually flatten out and stop indicating that the sensor was not a problem. 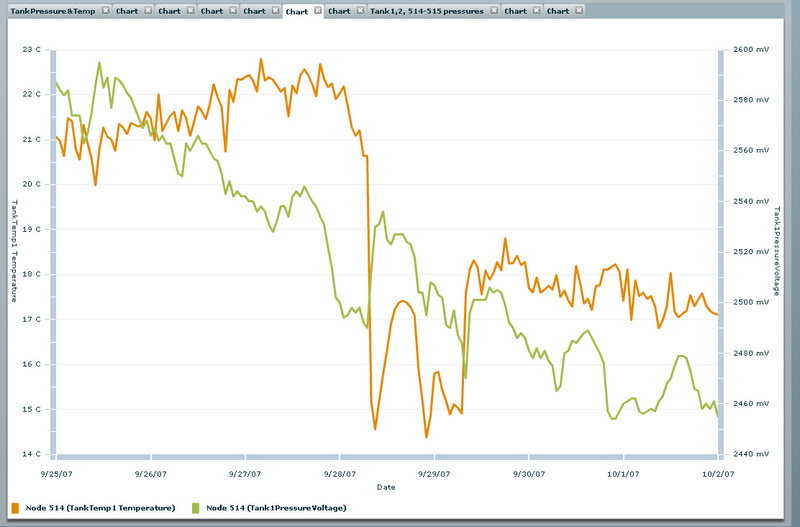 Fermentation temp graph vs. manual measurements is shown below. 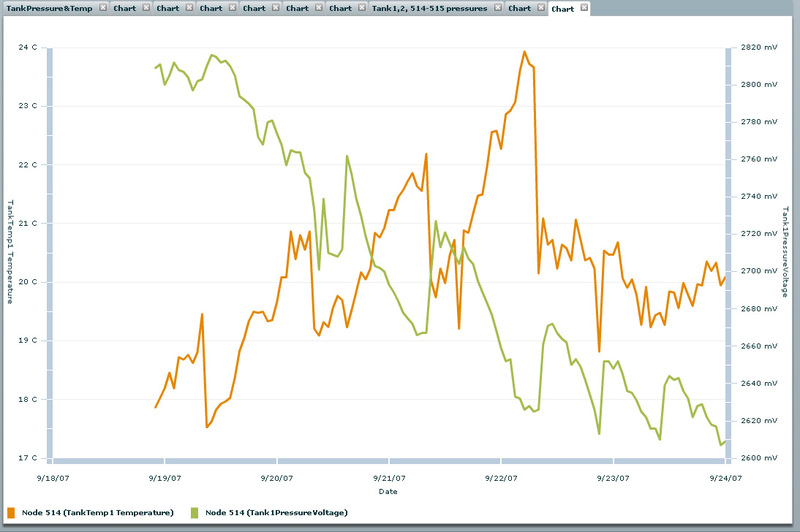 Note the manual measurements missed the peak fermentation temp which was 5 degrees higher. Note the punchdowns cause the thermal discontinuities which are especially large when the must temp is much higher than the ambient. 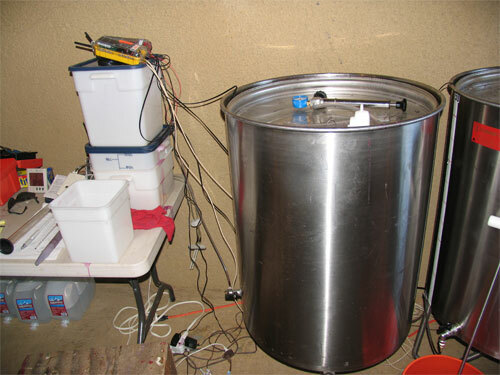 Punchdown can really cool off your ferment quickly especially in small tanks. The drop down of temperature on the 28th and 29th was due to an inexperienced puncher leaving the temp sensor out of the must. 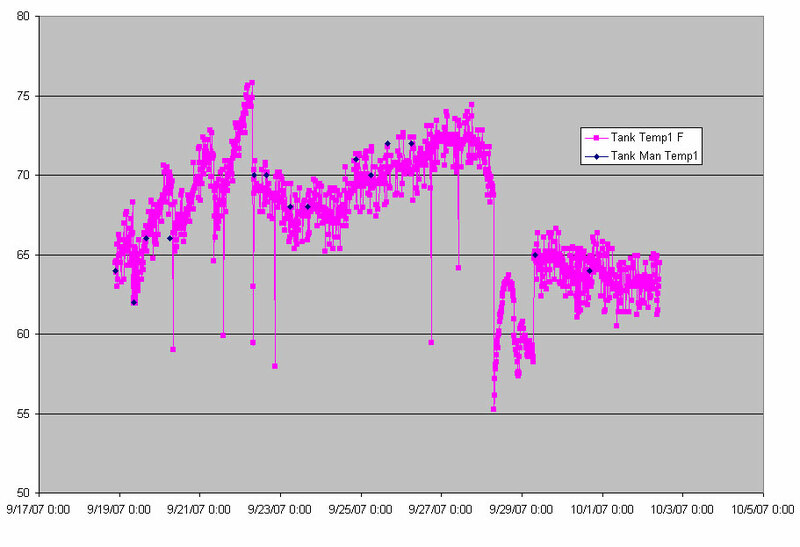 You can see the tank sensor tracking the ambient during that time it was out of the tank on the plot below. The plot below is a capture of the real time data grapher provided by Crossbow. Here you can see temp and must weight on the same plots. The first plot is the first half of the fermentation and the second plot the second half. The low going temperature transients are generally where the punchdowns occurred. 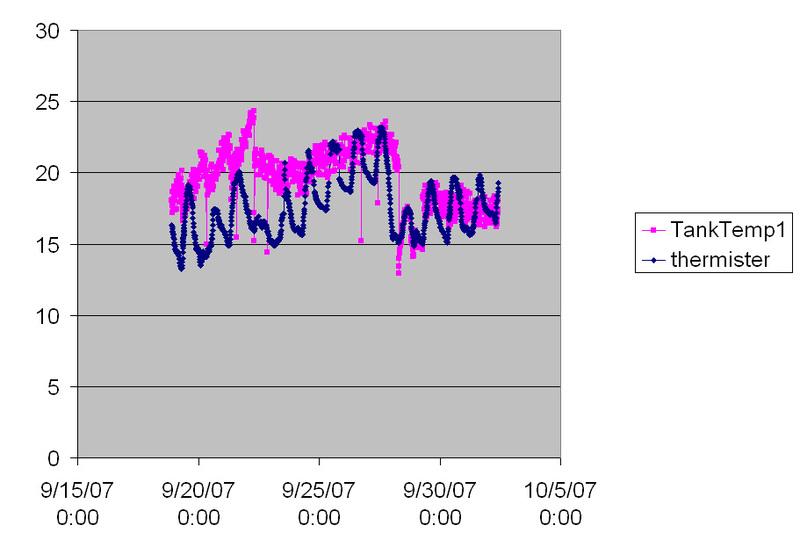 This experiment was repeated again with another fermentation started 10/6/07 on three additional tanks as well as ongoing monitoring of one of the first three tanks. There are some anomalies in the pressure data which appear to be due to must solids getting trapped in the tank port, valve and adapter fittings between the tank and the sensor. Still in general I have found the data to be useful. If you are interested in gaining access to these plots with real time data please contact me. There is a link to them on the Camalie Vineyards home page but, you will need a username and password to gain access. My cell number is 650-799-6571.